We talk about productivity and priorities all the time as entrepreneurs, usually in the capacity that we wish we were better at it. But sometimes, we’re just getting in our own way. Sure, you NEED to be on Facebook to grow your business presence there but you DO NOT NEED to be on Facebook as much as you are. This is something I strongly urge you to get a handle on with very specific boundaries (use Rescue Time or Time Doctor for your computer and phone). Another reason we get in our own way is that we sit down to work without a plan. I’m not referencing your blog planner or very neatly-written ‘to do list.’ I’m talking about having goals which drive your daily work. If you need help with that, set up your free chat (30-minutes, no selling – just help). 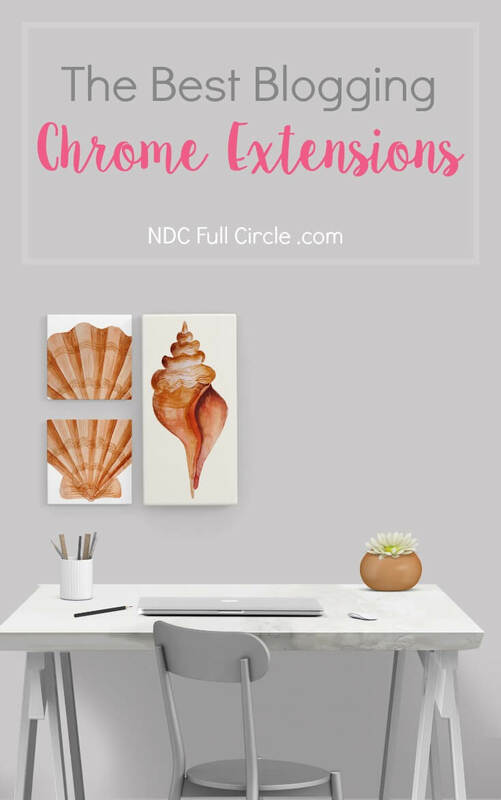 Today, we’re going to talk about how Chrome extensions can help you work productively, task yourself, and use shortcuts to support your growing blog business. I’ve included a partner link for Grammarly because it’s a darn good partner to have in this business. If you sign up, I could receive a commission. This one helps me key stats and actions my readers take on any page on any of my sites connected to Google Analytics. I sing its praises because it can give you actionable data (the best kind of data). When I have more than 10 people under “real-time,” I’ll head over to Analytics and take action based on what brought them there or their paths. I am able to see where people click while reading an article, how long they’re spending on site, and even what sidebar promotions are catching their eyes. I really like this extension. I’m a huge fan of Tailwind’s extension because of Pinterest’s seemingly “LET’S CHANGE-ALL-THE-THINGS-AT-ONCE” 2017 business plan. I can quickly add a quality piece of content to my queue and move on without missing a beat. The Pinterest extension comes in handy when I can’t find someone’s share buttons. This is a neat thing I’ve recently started using (I replaced Momentum, which is great for a single focus). 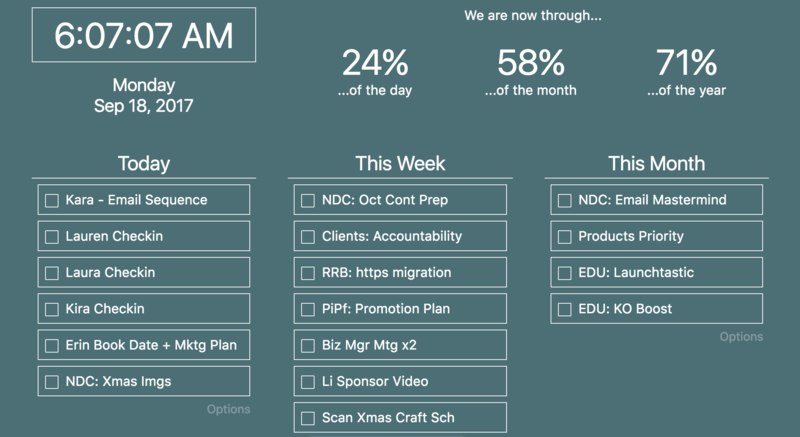 PrioriTab allows me to jot down the day’s, week’s, and month’s priorities while counting down. I’m not sure why, but that countdown reminds me to keep my focus. And here’s a little tip about productivity: change the background color based on your mood and a project’s urgency. The right color can motivate you! It’s no secret I manage A LOT in OneNote and with a team of people, it’s so easy to share ideas and do research. When I come across an article I want to share, reference for an article I’m writing, or send to a client, I clip it and don’t have to keep as many tabs open. I know some people use this to determine what links NOT to click, but I use it differently and wanted to highlight how bloggers can use it. When you’re working with sponsors or affiliate marketing, double-checking your links for ‘nofollow’ status is smart business. This makes it easy. This is a neat way to turn any of your blog posts into a lead magnet. It’s not as clean as Beacon.by (which I love), but it does a ‘quick-and-dirty’ job. It also allows you to edit a bit before finalizing. Shout-out to Katelyn of What’s Up Fagans? for introducing this one to me. I’ve used it more than I thought I would. I’m not the one to teach you about this. The extent of my knowledge is that if it alerts me, I take action (or most often, pay someone else to take action). I just downloaded this because, well, I’ll let the picture speak for itself (and my horrible tab-management problem). This lets you bookmark a tab to come back to later but cleans up your mind workspace. It’s just because one of my FAVORITE Chrome extensions for bloggers, especially those who research for their articles. If you want to find brand or PR agency contacts, Email Hunter is handy. I mostly use the methods I teach in Pitching Perfection, but it’s good in a pinch and to validate what you’ve found. It’s my password system (many also like LastPass). It keeps me sounding like I remember all those grammar lessons from my schoolin’ years. 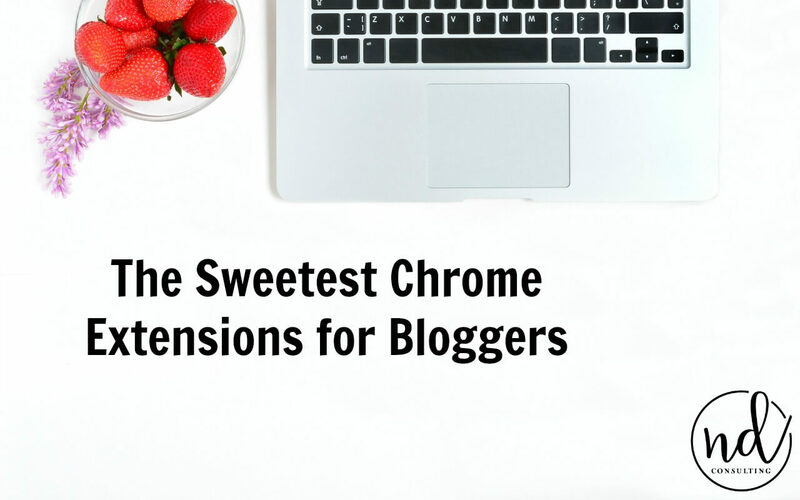 This is one of the BEST (and most-used) of my favorite Chrome extensions for bloggers. You need it. I use this ALL THE TIME. Usually, it’s because I created a Pin doing well and want to replicate the colors. #lazymarketingtip Sometimes, it’s because I’m creating something and want to use the colors I came across in a photo (another good resource for this is Design-Seeds). Over to You – Your Best? Those are my top picks as the best Chrome Extensions for Bloggers. Because I’m always on the lookout for new ones, share your favorites below! I love this list Sarah! I have many of the ones you suggested. I use Momentum but as soon as I saw Prioritab, I was all over it! I love these kinds of reminders to keep on task (and note what my goals and priorities are for the week). One of my favourite tools (which you haven’t mentioned here) is Loom. It’s a screencast recorder and it’s amazing. I don’t do many screencast recordings, but when I do, Loom is the BEST! I also recently started using DRAG in conjunction with my gmail account and I’m really liking it. It helps me sort and prioritize emails into tabs (it’s like a Trello-style layout). So I have a column for reply today, reply tomorrow, and not urgent. I love it, but I know this kind of thing works for certain brains/personality types, so it might be overwhelming for others. Great post (as usual). Pinning this! Sheryl, I’m off to check out Just Read now. The cashback shopping is so smart! Great list of resources. I am currently on my work computer, but will download several of them once I am home and on my own. Thank you for sharing.